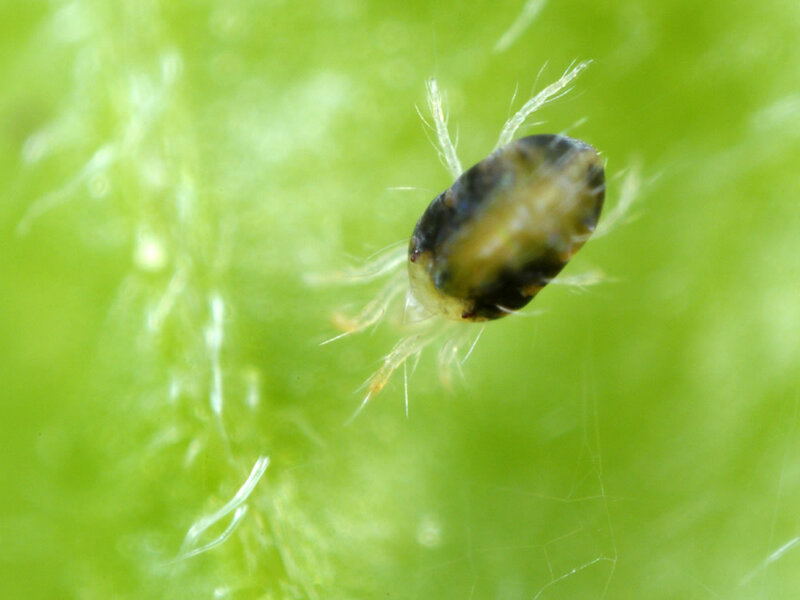 Fighting marijuana pests like spider mites, the easy way. Marijuana growers have a lot to be concerned about when it comes to protecting their plants, and pests are at the top of the list. One reason many growers grow marijuana indoors is it gives you a way better chance of having zero pests on your marijuana plants. The marijuana grower team members at BigBudsMag.com are located across the country, and we monitor pest epidemics in marijuana gardens indoors and outdoors. 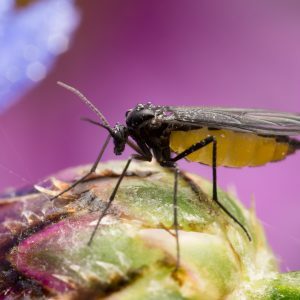 The biggest marijuana pest problems for indoor marijuana growers this year are fungus gnats, root aphids, thrips, broad mites, and spider mites. Outdoors, the most persistent marijuana pest problems we’re seeing are aphids, mites, slugs, bud worms, caterpillars, and leaf miners. Many marijuana growers discover that store-bought soil contains pests. The most common marijuana pests you find in bags of soil are root aphids and fungus gnats. A couple of years ago, you could hardly find a commercial soil sold at hydroponics stores that didn’t come with on-board gnats or aphids. Soil companies heard marijuana growers’ complaints, and have cleaned up their act. We’ve used many cubic feet of Fox Farm Ocean Forest and Happy Frog soils this year, and haven’t found on-board pests like we used to. Yay! Of course, prevention is your first line of defense. If you’re running indoor grow ops, the first thing you do is sterilize your grow room and equipment using natural disinfectant sprays, vacuum cleaners, and natural insecticides several weeks before you put any cannabis plants in there. Then, you seal up the room airtight so any inflow or outflow of air, and any entrances/exits, are controlled as much as possible so pests can’t get in. If you’re getting clones from other people, bring a magnifying glass to the clone location and carefully examine the clones before you procure them. Clones are one of the most common vectors of pests and diseases in our marijuana growing community. Of course, anything or anyone that enters a grow room can be a vector. That includes any person, any clothing, any pets, any air, any water, any soil, any grow equipment—you get the picture! You benefit by foliar spraying potassium silicate (I use a high-concentration potassium silicate product called Rhino Skin) on your marijuana plants. Not only does this provide potassium, it armors plants so pests have a harder time feeding on leaves and other structures. If you catch marijuana pests early, you save yourself a lot of trouble. Once a day I look at my marijuana plants with a magnifier. I look for leaves that are chomped (indicating leaf cutters, caterpillars, etc.). 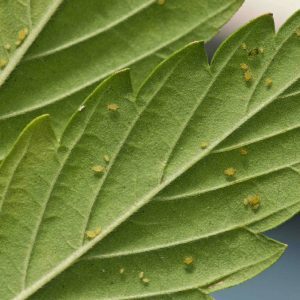 I also look for tiny dots, stipples, bumps, or other indications that miniature marijuana pests like mites, thrips, or aphids are on my leaves, stems or stalks. Especially if I’m growing in soil, I examine the soil with a magnifier when I open the bag, and periodically after my marijuana plants are growing in it. Also make it a habit to use yellow sticky traps in your marijuana grow room. Marijuana pests are attracted to yellow, and if you start seeing them on the traps, you know you’ve got a problem. If you discover marijuana pests at the beginning of an infestation, you might be able to stop them using mechanical methods. What I mean is using a natural botanical soap foliar spray, at a high rate of volume and velocity, to drown, suffocate, and blast the marijuana pests off your plants. However, this tactic doesn’t work so well when your marijuana plants have fat buds on them. Whatever you spray on your buds stays on your buds, and excess moisture in buds can promote gray mold (botrytis) that’ll rot your buds in a few days. If you discover marijuana pests are already well-established in your grow op, what should you do? The safest rule is don’t use poison of any kind, even during grow phase. Too many cannabis growers rely on poisonous products like AVID (especially for mite control), and it harms anyone who consumes the marijuana it’s used on. A natural, safe product called Azamax controls spider mites, thrips, fungus gnats, aphids, whiteflies, leaf miners, worms, beetles, leafhoppers, scales, mealy bugs, along with nematodes and other soil borne pests. If this one product sounds like a cure-all for marijuana pests that live in the root zone and above ground, you’re right, it pretty much is. The manufacturer says it can be used up to time of harvest but I won’t spray Azamax or any substance other than reverse osmosis water onto my buds when they’re within six weeks of harvest. The rule is: whatever you spray on your buds other than pure water stays on your buds, and you inhale it. Some pests require specific methods of application, because they put eggs onto your marijuana plants or in the soil. Your first application of Azamax will kill the adults, but their eggs hatch a few days later… so that’s why you might need more than one application. I recommend calling the Azamax manufacturer to find out specific tactics for the marijuana pests you’re trying to eradicate. Other factors that contribute to the spread of marijuana pests are plants too close together, inadequate aeration and air circulation, unhealthy plants, dirty grow rooms, and not enough grow room monitoring. If you’re unlucky enough to have a severe marijuana pest problem and the remedies are almost worse than the pests, or if it’s just too damned late to stop the infestation, you have to decide if you’ll harvest the crop anyway, or trash it. My tactic has been to fight the marijuana pests without poisoning my crops, and let them go all the way to harvest, even if there are pests on them. If whole buds are too ruined to be marketable, I use them to make concentrates (the process of making cannabis concentrates purges marijuana pests and other contaminants). An interesting tactic if you don’t want to use Azamax or sprays is to use beneficial insects that attack marijuana pests. This method has a learning curve, but it works better than you might have heard. 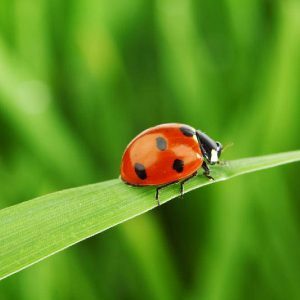 Contact a legit beneficial insects seller like this one, and ask what will fight the mites, aphids, fungus gnats or other marijuana pests you’re trying to stop… and how to use the recommended beneficial insects. I’m excited that you can use the techniques and products in this article to safely stop marijuana pests. Your cannabis plants are counting on you to protect them from marijuana pests, and the people who consume your marijuana are counting on you to provide safe buds that aren’t coated with toxins.